Another uplifting trip then to this much-lauded Camden venue where even the chocolate brownie and the rickety wooden chair may be close to assuming a place in North London roots music folklore. We’re here to hear Amelia White, a seasoned East Nashville performer. Lucinda Williams’ comparisons are, admittedly, obvious and facile for a reviewer to throw out, but they are not far off the mark either. Perhaps a little less downcast and focused on the grimmer side of life than some of Ms Williams’ more recent work, the voice and rhythms are of that ilk. With a swathe of albums over her last 20 years since relocating from her Boston roots, Ms. White has no shortage of material and has several UK tours on her resume. Some of White’s words are informed by her life as a touring female musician. ‘Free Advice’ lambasts male industry insiders who try to steer her into an uncomfortable girly demeanour with remarks such as, “You look good for your age.” ‘Get To The Show’ actually finds her pondering on retirement after a stopover at a less than enthralling city in the USA only to get all fired up again when she finds that she has garnered a glowing review in Rolling Stone. On tonight’s showing, one can see why the esteemed Rolling Stone rates her highly. Jamie Freeman has an impressive set of recording and song-writing alliances on his CV, having been based for some while in Nashville although his Britishness comes through in his delivery and style. The opening song, ‘Hasia Dreams’, was the tale of a Syrian refugee as she makes a troubled boat journey and showed his crystal clear voice and great way with a melody to good effect. A murder ballad, ‘Hey Hey Indiana’, delivered largely acapella, was set in the harsh winter of an Indiana farming community. But most of his songs tonight were about tight social or domestic situations – indeed one details the hanging of a picture on the wall as the trigger for analysing a couple’s tribulations. With a new album poised for release he played the radio friendly single plucked from it, ‘All In The Name’, and, maybe paradoxically, its more straightforward accessible pop-folk approach is the lesser example of his lyrical and melodic strengths. At this point in her career, Amelia White could be considered one of the preeminent voices in the Americana world. Both an assured singer and superior songwriter, the music she makes comes across like the stuff of standards, even on first hearing. For those unawares, it ought to be known that White's recorded several exceptional albums. Nevertheless, "Rhythm of the Rain" ranks as one of her best, a compelling collection that boasts everything necessary to elevate her profile and bring her the wider recognition that's so clearly her due. If nothing else, the new album offers all the evidence needed that she ranks mention as one of today's most expressive chanteuses, a torch singer whose individual acumen and sultry, sensual delivery is at once compelling, captivating and thoroughly convincing. Her emotional investment in the material is obvious in every note and nuance, from the rollicking and robust "Little Cloud Over Little Rock" and "True or Not" to the seductive strains of songs such as "Sugar Baby " and "How It Feels," and when she opts for a beautiful ballad like "Said It Like a King," a lovely co-write with Lori McKenna, or the sweetly serene title track and "Mother of Mine," there's no mistaking her conviction and commitment. Likewise, the aptly named "How It Feels" comes across as nothing less than a veritable tour-de-force, a song that effectively sums up the sentiment inherent in the album overall. Suffice it to say that White has made her masterpiece, an effort that can effectively serve as the cornerstone of her career. Every track is superior, and more important, an astute example of both her talent and tenacity. Indeed "Rhythm of the Rain" offers a decidedly desirable tempo anyone can be happy to sway with. Lee Zimmerman is a freelance writer and author based in Maryville, Tenn. He also expounds on music on his web site, Stories Beyond the Music - Americana Music Reviews, Interviews & Articles. His new book -- Americana Music - Voices, Visionaries and Pioneers of an Honest SOund is available from Texas A&M University Publishing. U.S. " Rhythm of The Rain" Released January 25th. The U.S. 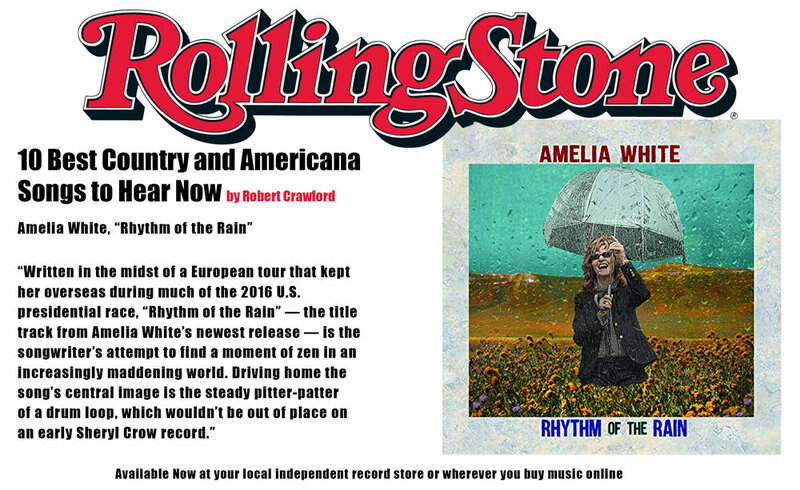 Version of Amelia’s “Rhythm of the Rain” came out officially on Jan. 25, 2019. it is for sale for your listening pleasure on Amazon and I tunes. The Touring has begun in US, CANADA, UK, SCOTLAND, and HOLLAND. Check the events section, and we hope to see you at a show.